If you are interested in buying chocolate in India, you really should consider Cacobean Chocolatier as your source of supply. Several months ago I was contacted by Patrick, one of the staff at Cacobean Chocolatier. He asked about the possibility of Chocolate Candy Mall helping them get some exposure in the US and around the world. We were happy to test his products and give an honest review based on our own personal tastes and preferences and let our readers know what we thought. You know me. I'm ALWAYS happy to taste-test chocolate!!! When they were ready to launch to the public, Patrick contacted me again and sent off a package of chocolate for us to try. I have to say, I was surprised by the volume he sent - pleasantly so! 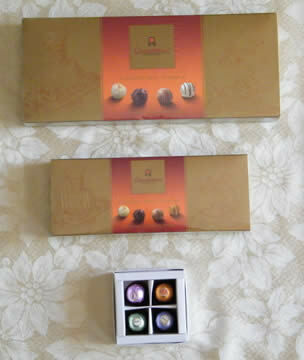 The package included several boxes of their truffles in varying sizes. Wouldn't you know it? The package arrived just as I was in the middle of a very restricted diet that kept me from sampling the chocolate from India for weeks! Just my luck! I was still determined to get started on this taste test, so I roped in several friends, colleagues, and family members to savor these morsels and give me their opinions (as I drooled silently on the sidelines!). Thankfully, I had plenty of Cacobean Chocolatier truffles to go around. Before I tell you about the chocolate reviews from the taste test, let me tell you a little more about what Cacobean Chocolatier has to offer. 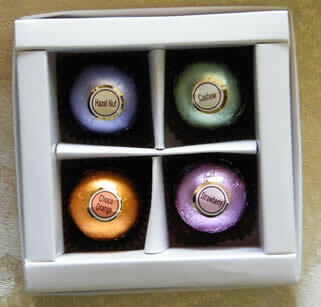 Not only do they have the basic truffles, they also have the same truffles that are decorated, not to mention a selection of truffles with various caramel flavored centers. You can also choose from a selection of pralines and two kinds of cream filled chocolate thins - mint and coffee. Almost everyone who tried the Cacobean truffles thoroughly enjoyed them. I won't say "ALL," and that's not too surprising since we each have our own unique chocolate preferences, but I can definitely say "MOST." The negative comments that I received weren't terribly negative. There were only a couple of people that weren't overly impressed. It wasn't that they didn't "like" the chocolate truffles, they just commented that they weren't very "more-ish." They weren't wanting a second one as they normally would. On the other hand, one friend, after tasting a couple, offered to buy all the remaining samples from me. :) He really liked them! Of course, I didn't sell them to him, but I figured that was a good sign that they were well received. I couldn't wait to taste them myself. Since I did have to wait, I asked my testers to describe the taste of the chocolate truffles. Those that really enjoyed them said that the chocolate was not overly sweet and that the cream flavors were "subtle" and "delicate." When I finished my special diet, I conducted my own personal taste test, and I had to agree. The chocolate truffles were lovely and for most of the cream centers, there was only a hint of the complimentary flavor, rather than an explosion. I think I understand why a few people commented that they didn't crave more after their first piece. From my own chocolate indulgence experience, the sweeter the chocolate, the more I want. Perhaps the mild flavor of the chocolate truffle candy was the cause of their lack of enthusiasm. I had never tried chocolate from India before, but I loved the experience and we were all thrilled to have the opportunity to taste and review these fine chocolates from Cacobean Chocolatier. If you want to buy bulk chocolate in India, you should seriously consider the Cacobean Chocolatier. They prefer to deal in bulk chocolate orders and are willing to ship worldwide. If you have a small specialty shop, you can arrange to buy bulk chocolate and boxes for packaging at wholesale prices and have the chocolate labeled with your own private labels. For more information about buying bulk chocolate in India, head over to Cacobean Chocolatier to see all of their options in more detail and contact them for your specific needs.